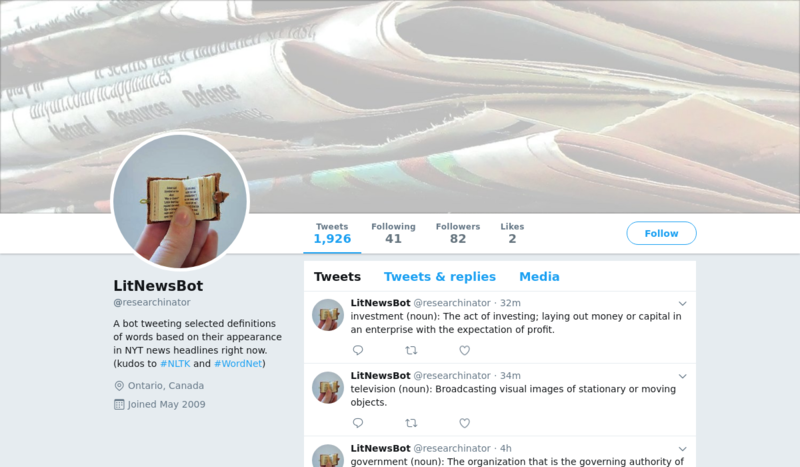 Lit News Bot is a Twitter bot created by Ross of Ottawa that scans the New York Times headlines and story summaries, and then tweets the definition of a word relevant to the story. At other times the bot similarly scans the news, then shares a snippet of a classic novel which shares some words with a current news item. devaluation (noun): An official lowering of a nation's currency; a decrease in the value of a country's currency relative to that of foreign countries. conservative (adjective): A person who is reluctant to accept changes and new ideas.